September Cause: Read A Book, Kid! It may be a digital world here, but the importance of the printed and bound book remains as vital as it was 100 years ago. This month, the team at Ninthlink will be hosting a book drive on behalf of Books First! to collect new and gently used children’s books which will be distributed to classrooms all over the county. Drop off those pre K through High School books (excluding text books) that have been sitting around collecting dust and put them to good use, by helping San Diego’s children learn to read! 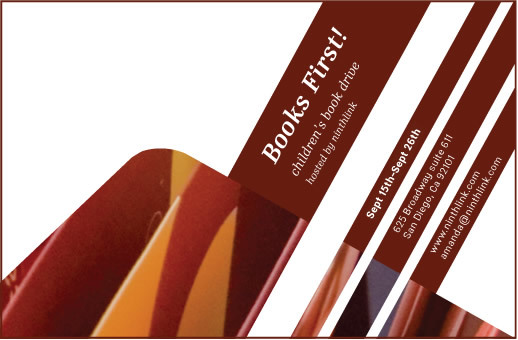 Picture books or chapter books, we’re accepting them! Indeed—those who read shall succeed. Look for the big white box! putting them in some danger and they SHOULD be afraid of. Well the wings can be done in a tribal black line work design or you can feature a tribal design on the sides or even behind the fairy. stutter and stammer when you approach her when delivering cute pick up lines. 7) “We don’t believe in rheumatism and true love until after the first attack. Excellent web site. Plenty of useful info here. I’m sending it to a few buddies ans also sharing in delicious. He imagines her moods as various kinds of colors, and her skin soft on the touch. write with your listing “Contact me with any queries or for more pictures. While the French put increased exposure of aesthetically pleasing designs, the English found functionality, reliability and accuracy a great deal more important. Begin the trick by taking off of the watch in your wrist and giving it to a spectator to hold. However, following the war, they appeared to have shifted their focus coupled with since become well-known on the rest in the world as a leader in innovation in addition to technology. like some of the text in your posts are running off the screen. Can someone else please provide feedback and let me know if this is happening to them too? Hey there! I’ve been reading your weblog for a long time now and finally got the courage to go ahead and give you a shout out from Atascocita Tx! Howdy! This is my 1st comment here so I just wanted to give a quick shout out and say I really enjoy reading your articles. isn’t any better method to improve your overall understanding of your desert wasteland environment than by playing in third-person mode. it’s possible to make this like a do it yourself process. triggered as long as it is strongly related the particular battle situation. have a presentation next week, and I’m at the look for such info. I’ll immediately take hold of your rss feed as I can not in finding your e-mail subscription hyperlink or e-newsletter service. as a way to survive these quicker than life games. Not just children, but matured are likewise in love with these games. the resale niche for these flash games is huge. alerted by having a email with my newest videos and articles. technology mostly because from the rise of 3-D and multimedia. But still, nothing has my heart just like a well-written, well-developed and designed RPG. have gained different looks and styles to cater to players spanning various ages and preferences. between utility based engineer’s to heavy hitting dreadnaughts. to make that you simply popular marriage shooter. It could be frozen it really is available or movable round the avatar. still one with the most expensive games for your PS1. The various players may also communicate with each other. If you wish to direct squad to kill groups of incomers, ‘Alien Swarm’ has to be your beloved. the sort. For more informations visit our site . few clicks away. The focusing with the game that pursues the retaliation of deserter. This piece of writing provides clear idea in support of the new viewers of blogging, that actually how to do running a blog. blog and I am inspired! Extremely useful information specifically the remaining section 🙂 I take care of such information a lot. aesthetic nursing, dermal treatments and also injectable procedures. it a lot mote search-engine pleasant.